Are you ready for WAR OF THE REALMS? We know you are! 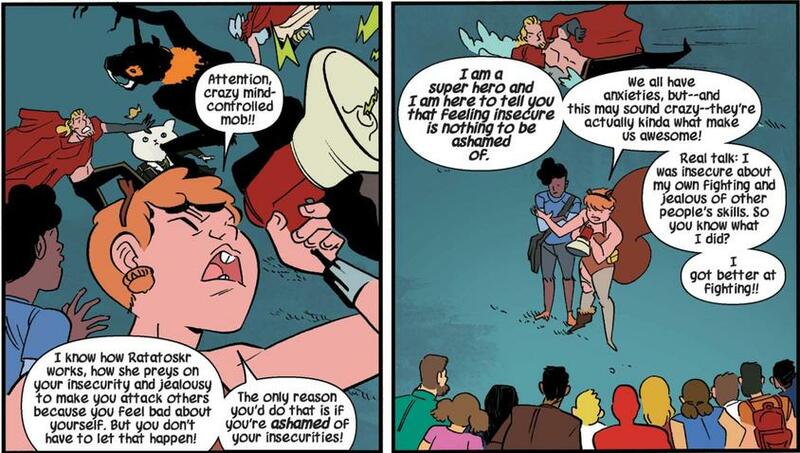 For Doreen Green, the awesome tie-in action is kicking off with UNBEATABLE SQUIRREL GIRL #43, when Loki recruits her for a secret mission. Is the God of Mischief up to something sneaky? Almost definitely. But with Doreen at his side, hopefully something good will come of it? With all this Loki scheming coming Doreen’s way, we thought we’d take the opportunity to highlight a few of the reasons why she – and the inimitable Nancy Whitehead, who has forged a bond with Loki herself – are exactly the BFFs Loki so desperately needs. Loki is certainly not the only morally questionable character Doreen has befriended. She gets through to the likes of of Galactus by helping him with his loneliness. Brain Drain and Kraven have become two of her closest friends. She understands that, at heart, they’re not evil – they have reasons for doing the things they’ve done, and she can relate. She doesn’t judge, and she applies that attitude to Loki, too. (There’s a whole spread about it in UNBEATABLE SQUIRREL GIRL #26). And for the famously misunderstood Loki, that kind of acceptance is critical when it comes to choosing friends. Loki never turns down an opportunity to make fun of Thor. So when Nancy draws an adorable kitty version of the God of Thunder, Loki is all about it! 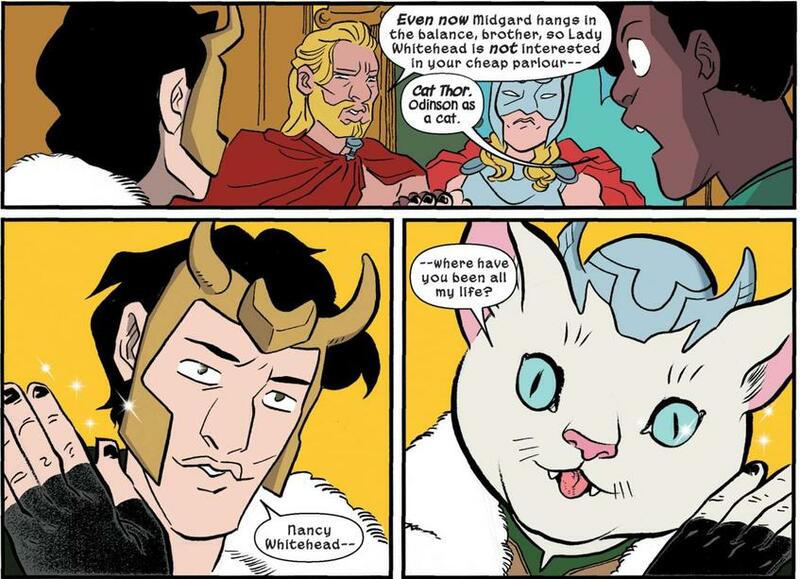 He even transforms into Cat Thor himself to please Nancy. And a friendship based on taking the favorite sibling down a notch or two is one that’s bound to last. As we know, Loki prefers to use his brains and cleverness to defeat his foes, rather than his fists. And while Doreen has superhuman strength and can definitely drop the boom when she needs to, she and Nancy like to use their intelligence and their mad computer science skills to solve problems and defeat villains whenever possible. Time and again, it’s math and science that save the day for them, not brute strength, which is something Loki respects. Part of what we all love so much about Doreen and Nancy is that they are unapologetically themselves. They don’t exactly fit in, but they don’t try to. They embrace the things that make them unique and set them apart from the crowd (like bushy tails and a proclivity for drawing animal versions of Super Heroes). Loki has always struggled with self-acceptance – on one hand trying to win Odin and Thor’s approval, but on the other wanting to prove that he doesn’t have to be like them and that he’s worthy just as he is (even if he can’t lift Mjolnir). Having people in his life who embrace their individuality could be hugely beneficial for Loki. Loki masterminds some pretty high-stakes shenanigans, but he always does it with a wry smile on his face. Honestly, it seems like he hatches half his schemes just to amuse himself. (Have you checked out VOTE LOKI?) While his sense of humor is pretty dry and Doreen and Nancy’s is pretty goofy, they all have the ability to see the humor in dramatic situations. And if you’re going to pal around with the God of Mischief, you can’t take the world too seriously. 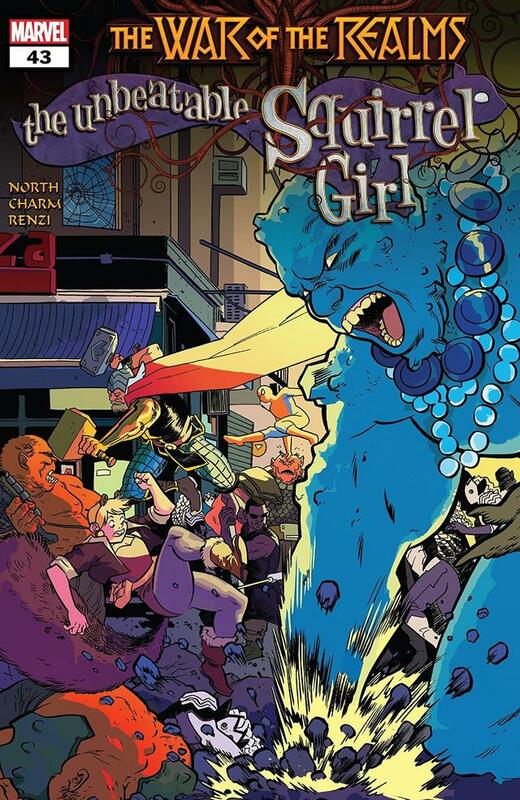 UNBEATABLE SQUIRREL GIRL #43, written by Ryan North with art by Derek Charm and Rico Renzi, is available now online and at your local comic shop! For more about WAR OF THE REALMS, visit marvel.com/war-of-the-realms!